Ask just about anybody, and they can tell you about the time they spent wearing braces. Many people visit their orthodontics office during their formative years, and even their adult years, in order to improve the appearance of their smile. Braces are often the best solution. Your orthodontist in St.Louis, MO, Dr. Blake Borello, has options available that extend beyond traditional braces, including Invisalign. Regardless of the type of braces that you have, it’s pivotal that you know how to take care of your teeth while you are wearing them. Brush your teeth frequently, and make sure that you are using the proper technique for brushing while wearing braces. When you are wearing braces, it is more difficult to remove food particles and plaque from your teeth. We recommend that you brush your teeth after every meal, if possible, in order to remove food as quickly as possible from the area surrounding your braces. When wearing braces, you will want to use a soft brush in order to clean effectively and safely around any brackets or wires in your mouth. Don’t forget to rinse when you are done brushing! Enjoy foods that are safe to eat while wearing your braces. While you won’t have to alter your diet completely while you wearing your braces or using Invisalign, you will want to select healthy, nutritious foods that also won’t damage your braces. Foods to avoid include sticky candy, chewing gum, crunchy nuts and popcorn. Some of the best foods to enjoy while wearing braces include bananas, pasta, and chicken, because they are easy to consume and low in acidity. Don’t forget to schedule regular cleaning appointments with your dentist in addition to your routine orthodontist visits. Visit your dentist at least every six months for a thorough cleaning. Your dental professionals will be sure to clean around your braces effectively, and will help you improve your brushing and flossing techniques if needed. They will notice the first signs of decay, and can help prevent further complications from occurring. 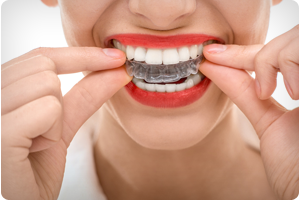 When you make the extra effort to keep your teeth clean and healthy while you are wearing your braces, you will enjoy a bright, white and perfectly straight smile as soon as your braces are removed. Dr. Borello, of Borello Orthodontics, works with each patient on an individual basis in order to provide personalized results. As a St. Louis orthodontist, his goal is to achieve healthy, happy smiles for all of his patients! To find out more information about our practice or to schedule a consultation with your orthodontist in St. Louis, contact us today at 636.625.4224 . This information is not meant as medical advice. It is provided solely for education. Our St. Louis orthodontic office would be pleased to discuss your unique circumstances and needs as they relate to these topics.